At New Hope UMC we strive to offer meaningful and vibrant worship each week. We offer two worship services on Sunday mornings. The 8:00 a.m. worship celebration is usually Lay Lead. There is hymn singing, a time of joy, concerns, prayers, Scripture, and a message by the speaker of the day. 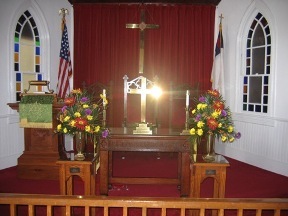 The service is held in the Church Fellowship Hall. The sacrament of Holy Communion is celebrated on the first Sunday of each month. Please join us and enjoy a coffee, juice, pastries, and great conversation before and after the 8:00 a.m. service. This service will continue to evolve over time. The 10:00 a.m. Service is held in the sanctuary and is a traditional service of worship, incorporating hymn singing, prayer, Scripture and a sermon, as well as music provided by our choir. The sacrament of Holy Communion is celebrated on the first Sunday of each month. The sacrament of Christian baptism, especially for infants, is observed virtually every week. Dynamic preaching by the pastor and stirring music by the choir make this hour the central part of our worship as a congregation. Children’s Time is held every Sunday at 10:15 a.m. Children’s Time helps the children to be a part of and not separate from the congregation. It help’s integrate them into the church service when they are older. Teachers rotate each Sunday and weave the sermon and Bible stories together during Children’s Time. This time together is not only instructional and interactive for the children but for the whole congregation. Sunday School classes at New Hope UMC are focused on the study of the Bible. As we learn more about the Bible we discover the scriptures tell us repeatedly to study God's Holy Word and use this knowledge to teach others about how the scriptures direct our paths. We encourage anyone who wants to learn more about the Bible to come and learn with us. Sunday School immediately follows Sunday Worship Service. Church etiquette is the customary rules for conduct and behavior in a church of God. United Methodist Worship blog This is the place to ask questions, post ideas, and at least begin some conversations about worship in all its forms across the United Methodsit connection and beyond. At least one new article or conversation will be started each week. And you can become a blog author at this site. Ministry Matters™ This is a new resourcing service from the United Methodist Publishing House. Right now access to everything is free including Bible Commentaries, Worship resources, curriculum and teaching resources. It's an amazing library of resources published by Abingdon. New TestamentChristian scriptures from Wikipedia Encyclopedia. The New Testament GatewayWeb Directory of internet resources on the New Testament sponsored by Duke University. Old TestamentScriptures from Wikipedia Encyclopedia. Audio BibleThe King James version via real audio. Bible AnswersArticles on Bible topics, and a Bible course which will teach you the basic contents of the Bible and how it all fits in together. Click on the link to pull up Bible Gateway. At the top of the page you will see "Enter keyword, passage, or topic". This is where you will enter the passage you would like to see, for example: John 19. This page was last updated Wednesday, October 16, 2018.